Using our official Woo + SalesBinder plugin, you can synchronize all of your inventory data directly into your WooCommerce website and then have all your online sales automatically entered into your SalesBinder account. This plugin will automatically sync your SalesBinder data into the WooCommerce plugin and place your inventory data into the “Products” section. There's no custom theming required or programming knowledge needed. 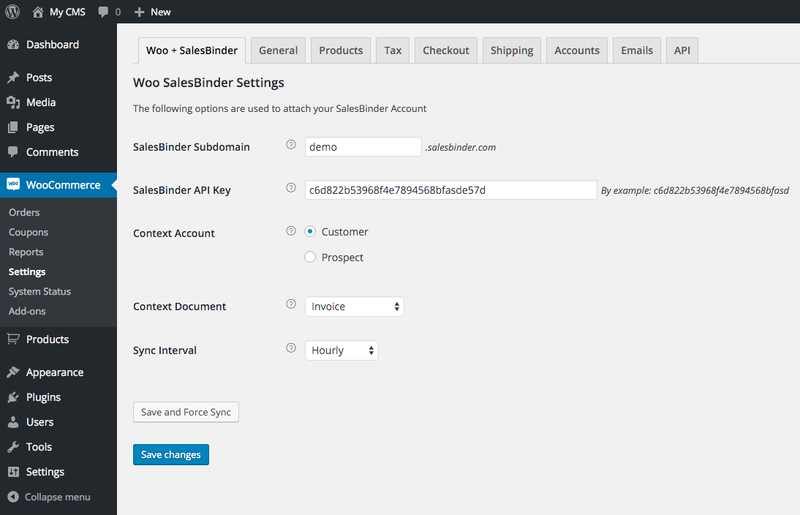 In the WordPress Dashboard you will find a new "Woo + SalesBinder" tab under "WooCommerce" → "Settings"
You're done! Now visit www.your-website.com/shop (replace your-website.com with your own domain name) and you should see your inventory start to load up.